Machno Carwyn is the best show-jumping pony stallion in Europe, and probably in the whole world. Since the beginning of his sport career in 1997 he has been placed more than 220 times in official competitions, approximately 140 times in international CSIP/CSIOP, winning more than 50 times. He has been placed more than 25 times in international Grand Prix of which he won 7. He has more than 14'000 Swiss francs in official winnings (an international Grand Prix counts as 150 Swiss francs, so it just goes to show how much he has won). 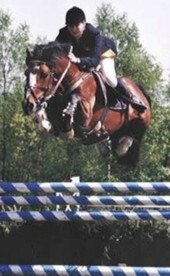 He is the only pony stallion ever to have won a gold medal at the European Showjumping Championships, which he won twice (and once 4th ridden by a young boy of 12). No other stallion has gained a medal in the 31 year history of the Championship. He is also the only pony stallion ever to win the Swiss National Championships, which he has won 4 times and once the bronze medal. This pony is simply a genius! 1997 Placed 20 times out of 22 competitions. 1999 Placed officially 22 times including 8 wins. Winner of the Top Pony Trophy and the Swiss championship cat D. Placed 10 times in CSIP at Cinzano and Verona (I), Auvers (F). Finished 11th in the individual European Pony show-jumping championships. 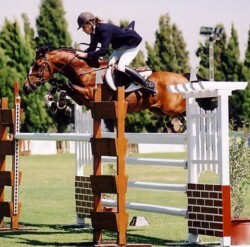 2000 Won the individual European show-jumping championship. Won the Swiss pony show-jumping championship for the 2nd time. 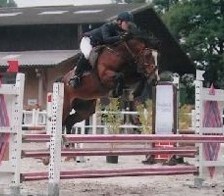 Was placed 23 times in CSIP/CSIOP at Corminboeuf (CH), Cinzano, Bracciano, Verona (I), Lons-le-Saunier (F) and Hagen (D). Was awarded "Pony Stallion of the Year". 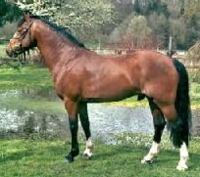 2001 Winner of the Grand Prix at Cinzano (I), Courlans (F) and Modena (I); 2nd in the Grand Prix at Chartres (F), Corminboeuf (CH) and 3rd in the Grand Prix at Nichelino (I) and Liège (BEL). Winner of the individual European pony show-jumping championships for a the 2nd time at Vejer de la Frontera (ESP). Winner of the Swiss pony show-jumping championship for the 3rd time. Was placed 25 times in international competitions, winning 5 times. 2002 Machno Carwyn is now ridden by Jordan, Faye's younger brother aged 12 who has no previous experience of international competitions. Was placed 2nd in the international Grand Prix at Cinzano (I), Fontainebleau (F) , Lummen and Liège (BEL), and 8th in the Grand Prix at Welkenraedt (B). Finished 4th in the individual European pony show-jumping championships in Lanaken (B) and completed a double clear round in the team competition. 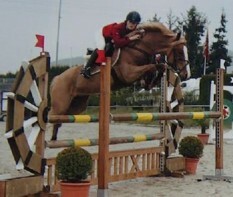 Won the bronze medal (3rd) at the Swiss pony show-jumping championship and the Swiss Romand championship. 2003 Was placed in every international Grand Prix in which he competed Won the Grand Prix at Courlans (F) and Cinzano (I), was 2nd in the Grand Prix at Arezzo (I) and Marsens (CH), 3rd in Liège (B), 5th at Moorsele (B) and 6th at Le Touquet (F). Unable to compete in the finals of the individual European pony show jumping championship due to 1 time penalty, he nevertheless won the Swiss show-jumping championship for the 4th time. 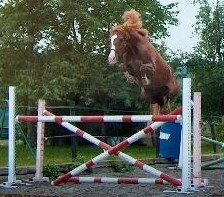 He also won the Top Pony Trophy and came 2nd in the Swiss Romand championships. 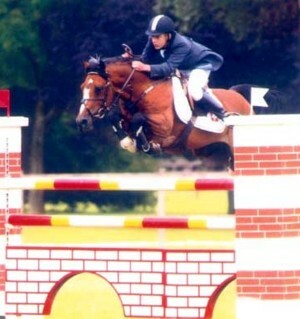 He also won 4 P5 competitions (the highest show-jumping competitions for ponies in Switzerland). 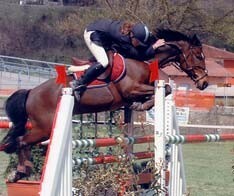 2004 He was placed 13 times in the first 3, winning 5 times and 17 placings out of 19 competitions. Unfortunately an accident to his eye meant he was unable to finish the season and has since been retired. Mirimor Estel by Carwyn dam Lizzie, born 2009. Many of Machno Carwyns' offspring have excelled in other countries all over Europe such as: the UK, Germany, Belgium, Holland, Spain and Italy together with the USA. But, it is very difficult to obtain verifiable results as France seems to be the only country who publishes the Sire's name. · Style de Blonde (from the French bred mare, Pin Up de Blonde by Linaro, Poet) French national vice-champion colt foal in 2006; 4th in the French national 2 yr old colt championship in 2008; 3rd in the French national 3 yr old colt championship and approved as a stallion. · Plein Vent de Blonde (from the French bred Welsh Cob mare, Brise Matinale by Ceulan Nathan. Full brother to Malforin Mac Baloubet). Competed internationally for Switzerland in 2009.